Wofford College has invited Dr. Jeff Meldrum to speak as part of a course titled "Urban Legends: (mostly) True Stories Verified by a Friend of a Friend." Below we have two articles; one from the Wofford's website, the second one is from the Local Fox news affiliate in South Carolina. 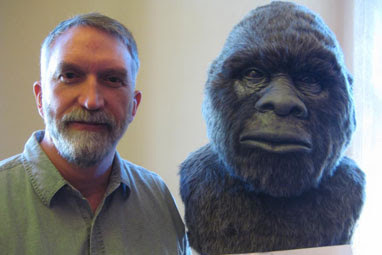 SPARTANBURG, S.C. – Renowned “bigfoot” researcher Dr. Jeff Meldrum of the Idaho State University, will speak at 2 p.m. Friday, Jan. 20, at Wofford to students studying “urban legends” during the January Interim. The program, to be held in the Olin Teaching Theater in the Franklin W. Olin Building, is free and open to the public. Meldrum, a professor of anthropology at Idaho State, is a widely known expert on primate locomotion and also has become renowned for his scientific research into the phenomenon of “bigfoot,” or “sasquatch.” He has appeared in a number of documentaries for the Discovery Channel and has written several popular books on the topic, including his most well-known, “Sasquatch: Legend Meets Science.” Meldrum is unique because he is on the short list of credentialed scientists who feel it is worthwhile to conduct scientific research into the bigfoot phenomenon. The Interim course “Urban Legends: (Mostly) True Stories Verified by a Friend of a Friend” is being taught by Jenny B. Johnson, assistant professor of accounting and finance and coordinator of the accounting program, and Ryan A. Johnson, assistant professor of accounting and finance. The course explores contemporary legends, including how urban legends are more than rumor and innuendo – they reveal individual values, prejudices, hopes and fears. Meldrum joined the ISU faculty in 1993, after a stint with Northwestern University. His research revolves around questions of vertebrate evolutionary morphology, especially primate locomotor adaptations. His formal study of primates began with doctoral research on terrestrial adaptations in African primates, and has since taken him from the dusty skeletal cabinets of far-flung museums to the remote badlands of Colombia and Argentina in search of fossil New World primates. He has published extensively on the evolutionary history of the South American primates and has described several new extinct species. He has documented varied primate locomotor specializations in laboratory and semi-natural settings. More recently his attention has returned to the emergence of modern human bipedalism. His co-edited volume, “From Biped to Strider: the Emergence of Modern Human Walking, Running, and Resource Transport,” proposes a more recent innovation of modern striding gait than previously assumed. As the acting director of the Center for Motion Analysis and Biomechanics (CMAB) he is collaborating with engineering faculty, paleontologists, and the Idaho Virtualization Lab, to model the pattern of evolution of the hominid foot skeleton. His interests also encompass the evaluation of the footprints purportedly left by an unrecognized North American ape, commonly known as sasquatch. Do you believe Bigfoot exists? SPARTANBURG, SC (FOX Carolina) - If so or if not, a seminar taking place at Wofford College on Friday will state the case that it is a real possibility. Renowned "bigfoot" researcher Dr. Jeff Meldrum of the Idaho State University will speak at 2 p.m. Friday, Jan. 20, at Wofford to students studying "urban legends" during the January Interim. Meldrum, a professor of anthropology at Idaho State, is a widely known expert on primate locomotion and also has become renowned for his scientific research into the phenomenon of "bigfoot," or "Sasquatch." He has appeared in a number of documentaries for the Discovery Channel and has written several popular books on the topic, including his most well-known, "Sasquatch: Legend Meets Science." Meldrum is unique because he is on the short list of credentialed scientists who feel it is worthwhile to conduct scientific research into the bigfoot phenomenon. The Interim course "Urban Legends: (Mostly) True Stories Verified by a Friend of a Friend" is being taught by Jenny B. Johnson, assistant professor of accounting and finance and coordinator of the accounting program, and Ryan A. Johnson, assistant professor of accounting and finance. The course explores contemporary legends, including how urban legends are more than rumor and innuendo – they reveal individual values, prejudices, hopes and fears. Copyright 2012 FOX Carolina (Meredith Broadcasting). All rights reserved.